Mr Gasket Low Rider air cleaner. If you are struggling to get adequate bonnet clearance, then this is the air cleaner for you! 14” Diameter pressed steel, plain chrome with paper element. 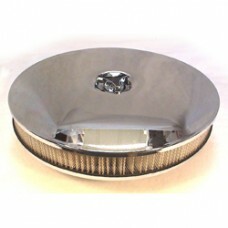 This air cleaner features a recessed base and so will sit lower over the carburettor. It is lower than all other air cleaners we stock. Fits 5 1/8” neck carburettors e.g. Edelbrock Performer Series, Holley.